For best results, students should be REQUIRED TO COMPLETE this training prior to or within 2 weeks after reporting for work. After taking a correct mortgage loan application (1003), the first thing the loan originator and/or processor need to do is to compare it against the person’s credit report. Checking names, residences, opened accounts, tradelines, credit limits, available credit, closed accounts, collections, charge-offs and other information vital to the outcome of the loan’s approval or denial. Sometimes there are errors in a report. Reading a credit report for the first time is very intimidating. Lots of pages with data, tables, codes, contact information, addresses, payoffs …the list goes on. One of the top reasons loans are returned or denied by lenders is the improper calculation of the borrower’s income. Regardless of who’s mortgage software you’re using, your software can’t look at the borrower’s income documentation and apply underwriting rules on what’s acceptable and what’s not. Only competent originators and processors can review the borrower’s income and decide if it’s acceptable or not. Adding up w-2’s is easy – BUT! Now that you understand credit and income. 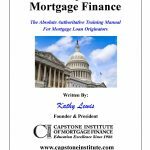 Now your ready to learn the important mortgage math and documentation every MLO must know and understand. 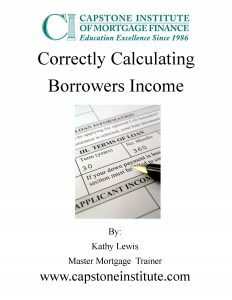 As a loan originator, you should know how to calculate every computation on the Loan Estimate and Fees Worksheet without the assistance of any mortgage software. We covered briefly the fees worksheet and loan estimate in the preceding class. Now we’re going to take some extra time and really drill into every and box line on both. Many loans have been lost because the loan originator didn’t retain their knowledge and when questioned by their borrowers they couldn’t show how their offer was better compared to their competitors. If your borrowers shares with you your competitors offer , you’ll need to know how to show them your offer is really better or how to restructure your offer so is is the best deal. With Capstone’s training mythology you’ll be able to calculate any part of the Fees Worksheet and new Loan Estimate Form in seconds using your own calculator. That’s the great thing about Capstone’s training, we teach you how to calculate everything using your own calculator. This means learning any mortgage software is going to be easy because you already know how the numbers work and where they go. All good Loan Originators need to understand how to start their own lead generation pipeline and not to rely on expensive and sometimes fraudulent lead providers. If the leads were so good why aren’t they originating and making the commissions? Well, look no further because Kathy Lewis has a 4 part lecture series to help motivate and start your career off on the right path. Pick a marketing series to listen to every week because every time you listen, you’ll come away with new ideas on how to generate more loan applications than your competitors.